I'm so over the cold and dreary weather. How about you? With the arrival of this latest arctic blast, I felt myself craving a warm, rich bowl of chili, but I didn’t want to spend all day in the icy cold kitchen making it. 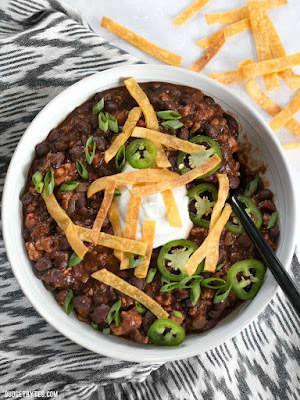 So, I made this super fast and simple Weeknight Black Bean Chili and crawled back under the cozy blankets as fast as possible (with a warm bowl of chili, of course!). 0 Response to "WEEKNIGHT BLACK BEAN CHILI"